Using a canned ham makes this dish a breeze to prepare and bake. The pineapple slices along with a tasty, tangy sauce flavor it nicely. This recipe makes a great centerpiece to a family dinner or festive occasion. Canned ham is clearly not as good in flavor or texture as a fresh or fully cooked ham, but it does come with a major advantage—the canned ham is often shelf stable. A large canned ham in the familiar pear-shaped can be stored in the pantry, usually up to two years. Read the label carefully, however, as some brands must be stored in the refrigerator. Note that this is a recipe for canned ham, not Spam. Heat the oven to 325 F (160 C). Cut the ham into 1/2-inch-thick slices, cutting almost to the bottom, but not all the way through. Tie the ham around the outside perimeter with a piece of kitchen twine to keep the slices in place. Drain the pineapple slices, reserving 1/4 cup of the syrup. Combine the pineapple syrup with the chili sauce, brown sugar, lemon juice, Worcestershire sauce, and chili powder in a bowl. Place the ham on a rack in a roasting or baking pan. Arrange the pineapple slices around the ham (you can secure them with toothpicks if needed) and pour the sauce over all the ham. Bake in the preheated oven for 1 1/2 hours, frequently basting with the sauce. Remove the ham to a serving platter, arranging pineapple slices around the ham; remove the twine. Cover loosely with foil to keep warm. Pour the pan juices into a 2-cup measure and add enough hot water (if necessary) to make 1 1/4 cups; transfer to a small saucepan. Combine cornstarch and the cold water in a small bowl, blending until smooth. Add cornstarch mixture to the saucepan and cook over medium heat, stirring, until thickened and bubbly. Drizzle the sauce over the ham and pineapple and serve remaining sauce on the side. 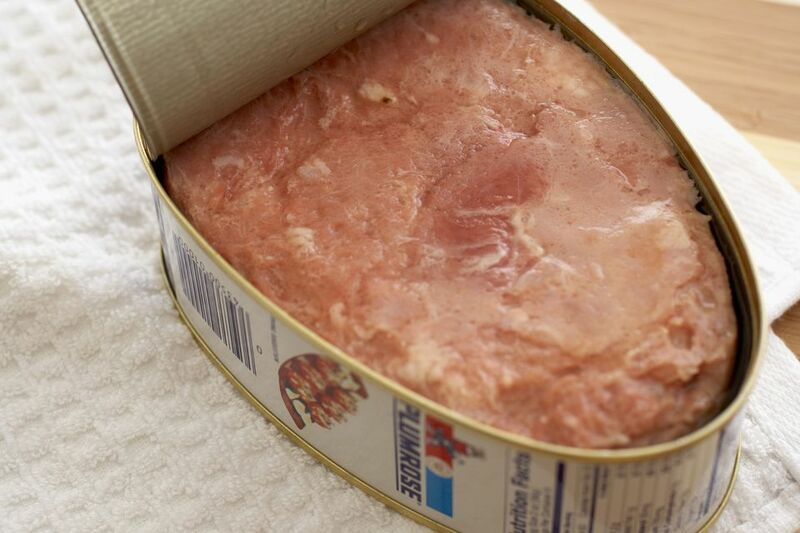 The canned ham may also be cut into individual slices for baking. The slices can be arranged in a single layer in a baking dish. Cover with the sauce and pineapple slices and bake in a 375 F oven until hot and glazed. Slices can be grilled or pan-fried as well. Fry slices of leftover ham and serve with beans or potatoes. Use leftover ham in scalloped potatoes or pasta casseroles. Chop leftover cooked ham. Add some sweet pickle relish, chopped celery, and some salt and pepper to taste. Add enough mayonnaise to moisten and use it to fill sandwich buns or rolls. Or pile it onto lettuce leaves for a tasty luncheon salad.